Saddleback Butte, elevation 3,651 feet, about a thousand feet above the broad alluvial bottom land of the Antelope Valley, on the western edge of the Mojave Desert. 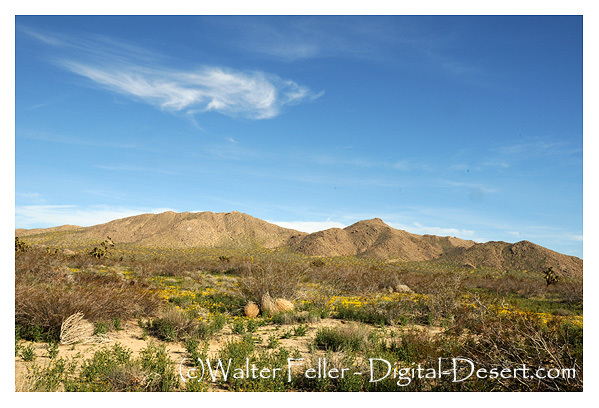 The state park surrounding Saddleback Butte was created in 1960 to protect the butte and examples of native Joshua Tree woodlands and other plants and animals that were once common throughout the high desert area. In the springtime (February through May) wildflowers may put put on a beautiful display of color. This is usually the best time to visit. Autumn (October and November) is also pleasant as well, however temperatures may suddenly change. Summer temperatures average 95° F and occasionally climb as high as 115° F, but evenings with warm breezes and clear skies are typical. Average minimum temperature during the winter is 33 ° F with frost and sub-freezing temperatures common, and occasional snow. Three trails, two of which lead to the summit of the butte are in the park. A loop trail about 5.5 miles long can be taken from the campground parking area 2 miles to the summit, 2.5 miles down to the day-use area and 1 mile back down to the campground along a gravel road. At the summit a 360° of the Antelope Valley and Mojave Desert can be enjoyed. Most of the trail is along gentle slopes through creosote bush habitat and then climbs steeply from the base of the butte to the top. A self-guided nature trail about .25 miles long starting at the visitor center takes one through examples of the natural history of the area. The visitor center, located at the entrance to the day-use area, featuring displays and hands-on exhibits about the natural and cultural history and geology of the area. Saddleback Butte State Park is home to once-abundant desert species that are slowly being extinguished by hunting, agriculture, and increased population; such as coyotes and kit foxes, jack rabbits, cottontail rabbits, ground squirrels, kangaroo rats, many kinds of snakes and lizards, and the occasional badger or skunk. Be cautious of the sidewinder and Mojave green rattlesnakes (the deadliest of the rattlers), which come out in the warm weather. One special highlight of the park is the desert tortoise, which may be seen by park visitors that have the curiosity and patience enough to learn the unhurried ways of this desert animal. If seen, however, the tortoise must be left alone as it is now listed as threatened on the Endangered Species List. Bird life includes many migratory species, and a few permanent residents- golden eagles, red-tailed hawks, ravens, and owls, and some smaller birds such as rock and cactus wrens, thrashers, blackbirds, horned larks, ladderbacked woodpeckers, sparrows, finches, and loggerhead shrikes. The park is 17 miles east of Lancaster on East Avenue J and 170th Street East.